The other day I had to export nine different parts of a training course I was editing in Avid Media Composer for one of my clients. Media Composer isn’t like Premiere where I can add a bunch of videos or sequences to a Queue in Adobe Media Encoder. 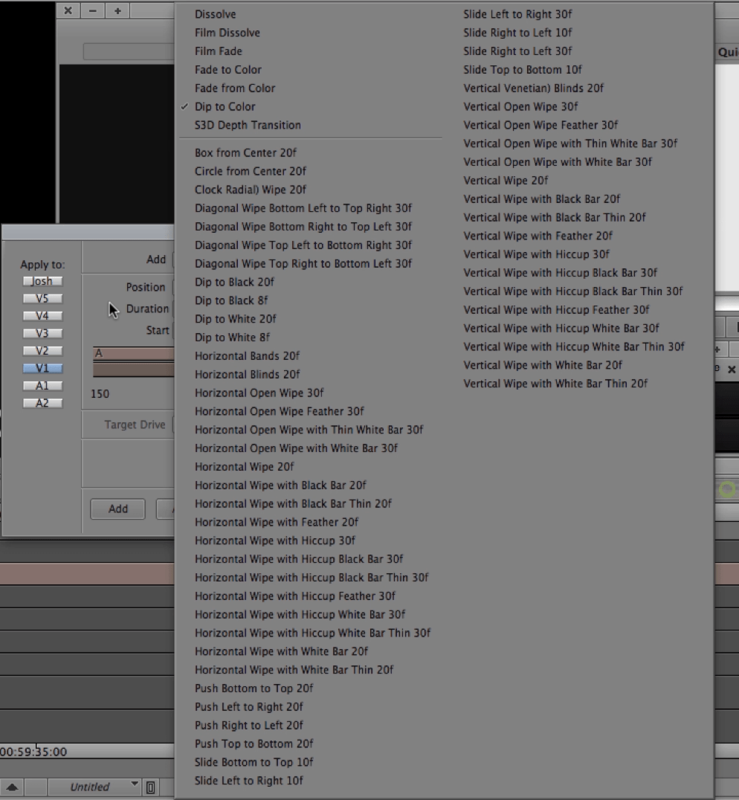 From inside a sequence you have to export them one at a time. This isn’t convenient for anyone. In this project in particular I’d have to go back and check every 20-30 minutes and then go and export the next video. However there’s a trick you can do to batch export out of Media Composer and I’m going to explain that in this post. In fact, this trick is allowing me to write this blog post then go take lunch outside at a park next to the Potomac River. Let’s jump right in. How do you batch export? Instead of exporting from a sequence we’re going to export from a bin. And to export from a bin we need to create copies of our master sequence(s) that we want to export. To begin create a new bin. Label it something like, “For Export Only”. Take your master sequence, set in and out points and select just the tracks you want to export. If it’s all tracks, select every track (Hit Cmd/Ctrl+A to quickly do this). Next duplicate your master sequence. Highlight it in the bid and hit Cmd/Ctrl+D to do this. Move the duplicated version into your For Export Only bin. Rename the duplicated version of your master sequence to the filename you want it to have upon export (i.e. abc-course-part1-v01-170418) but without the file extension. Go back to your master sequence(s) and repeat as needed until you have a bin full of sequences you want to export; each with their in and out points set and tracks selected. Close out of every bin expect your For Export Only bin. You don’t have to do this but I’m OCD about screen real estate and digital clutter. Then select all the sequences in your For Export Only bin. Right-click on the sequence icon for any of them (it’s the little film stripe next to the name of the sequence). In the menu that pops up find Export (pre V8.5ish) or Output (post V8.5ish; the name changed somewhere around MC v8.5). If you’re on an older version of MC it’ll open a dialogue box up immediately. If you’re on a newer version you will have to go into a sub-menu in Output then you choose Export to File… Once you do this the same dialogue box will pop up as in the older versions of MC. Navigate to where you want to files to go like a watch folder or an exports folder or just somewhere on your hard drive. Then go to your export settings at the bottom of the box. Set your export preset to a QuickTime Movie or whatever you want to export it as for you to then compress in Adobe Media Encoder or Sorenson Squeeze or another compression software. Go into it’s options (click the Options… button) and make sure Use Marks and Use Selected Tracks are checked (this might say “Use Enabled Tracks” in newer versions of MC…I’m still on 8.4.4!). Doing this means that you are MC to export the enabled tracks and in and out points you set for each sequence. 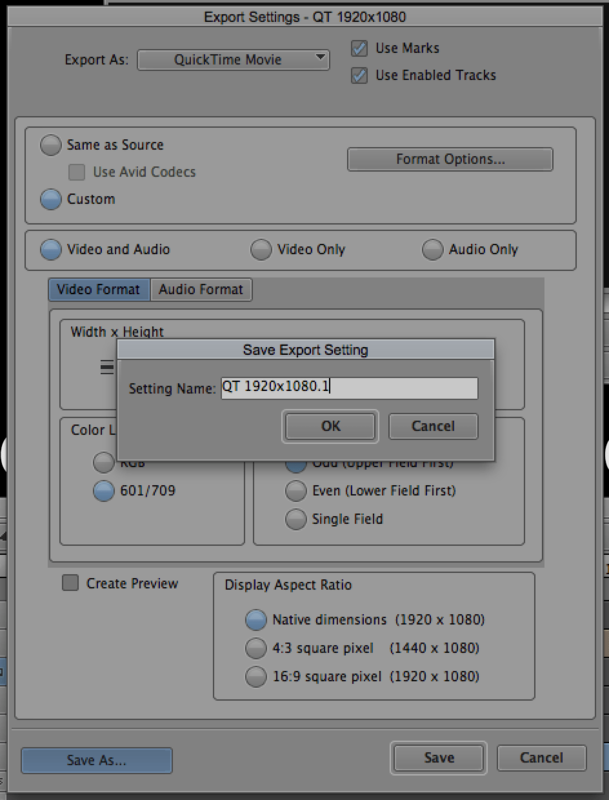 Click Save in the export settings then Save again in the Export As… dialogue box to begin batch exporting. I hope you found this quick tutorial helpful. If you have any questions please leave them in the comments below or shoot me a message here. P.S. If you’re new around here and want to know more about EVF and learn more helpful tips and tricks on being a faster video editor go to this page to begin your journey. And please never be shy if you have a question or just want to chat about editing (or baseball!). There are 10,000 posts like “The Top-8 Ways to Tackle Your New Year’s Resolutions” streaming through your social media timelines and inboxes right now. This post is not one of them. This short post is to tell you that you can do whatever you want to do and give you a quick tip on succeeding in whatever goals you have whenever you have them. Presets will make you a faster editor. Period. Putting systems in place for often-used tasks makes you a more efficient editor. Presets are some of these systems. You can preset many aspects of your NLE, especially Avid Media Composer. Below I discuss four of my favorite areas you can use presets. This post focuses on presets in Avid Media Composer but some concepts should be able to cross over into other NLEs like Premiere Pro and Final Cut Pro X.
Workspaces are preset arrangements of your tools on the screen. There are 3-5 Workspaces (sometimes referred to as Toolsets – different but essentially the same thing which I’m not going to get into today) you should customize, save and map to your keyboard. These are preset arrangements of your tools on the screen. The first is obviously Source/Record Editing. This is your bread and butter Workspace, which you’ll most likely spend the bulk of your time in. 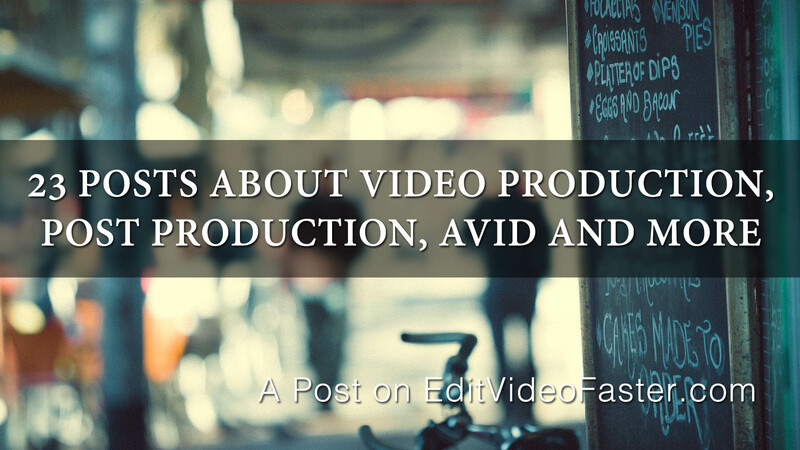 You use it for your standard editing – laying in shots, moving them around, manipulating time, etc. Why do you map this to your keyboard? Anytime you are done in another Workspace or you have random tools open, this will put you back in your default editing setup. 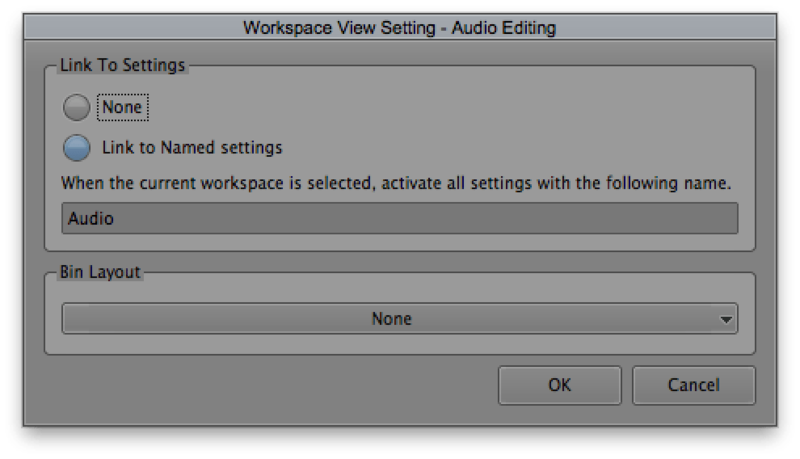 If you want the Timecode Tool, Markers, Audio Tool and Audio Mixer open while you are editing in this Workspace like I do, make sure the Source/Record Editing Workspace is selected under Windows > Workspaces. Then open all the tools you want and position them on your screen and hit Save Current under that same menu. If you want to see a tutorial over on my YouTube channel let me know in the comments section! Audio Editing is the next Workspace to setup. Besides setting up my audio tools where I want them, I like to tie this together with my Audio Timeline View, which will be discussed in the next section. To do this, go up to Windows > Workspaces > Properties… then type in “Audio.” If you have a Timeline View named “Audio” it’ll automatically switch to that view. Color Correction is another Workspace that should be setup. I’ve found that the only real things you need to adjust are the location of the monitors and Color Correction Tool along with what goes into the monitors by default. I tend to like having the left monitor being set to Previous, the middle monitor set to Current and the right monitor set to RGB Parade. If you don’t have a traditional confidence monitor or work solely on a laptop/single monitor system like I do at times, the Full Screen Playback Workspace should be mapped to your keyboard. FYI – sometimes Full Screen Playback won’t run on the monitor you want it to if you are running two screens or switch between 1-2 screens often. If that happens, go to Settings > Full Screen Playback. 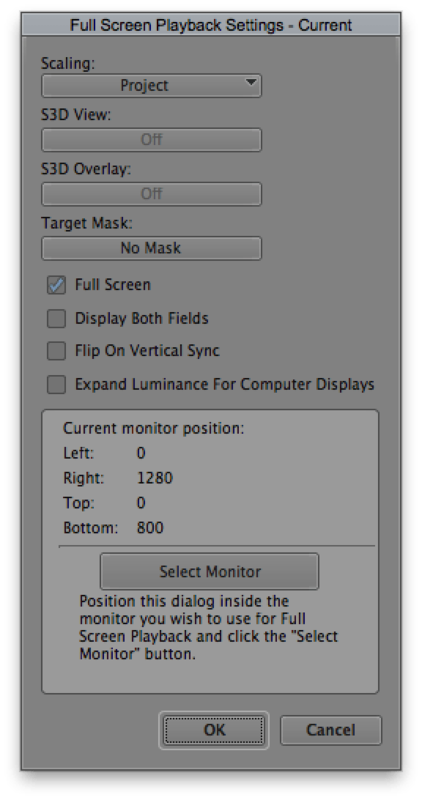 Then move the dialog box to the monitor you want to be full screen. Then click Select Monitor and click OK. The last Workspace you might want to setup is Effects Editing. To be honest, I don’t use this. 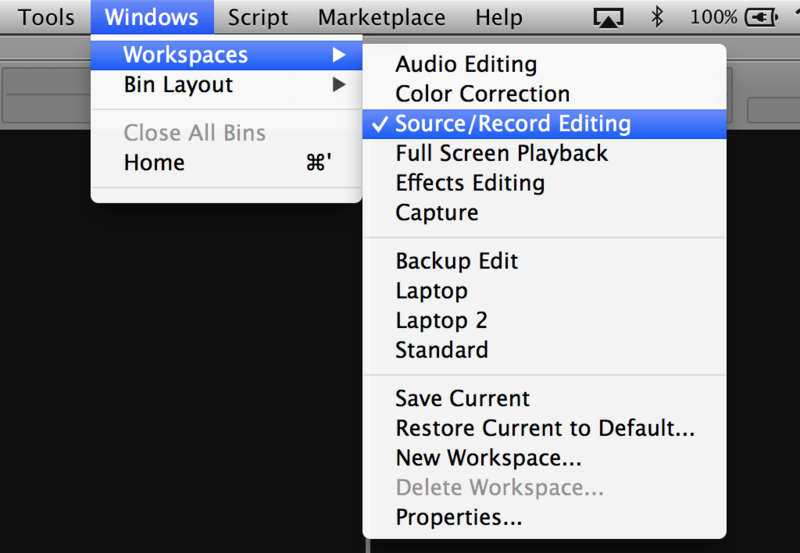 I have my Effect Editor positioned in my Source/Record Editing Workspace. Do this by opening the Effect Editor, save the current Workspace, close the Effect Editor then save the current Workspace again. This tells Avid Media Composer “I want this tool positioned here but don’t want it open when I activate this Workspace.” From there, I map Effect Editor to my keyboard always staying in the Source/Record Editing Workspace with it open. The advantages of having the Effects Editing Workspace setup is that you might want more room for your monitors or the Effect Editor than you would with the Source/Record Editing Workspace. For me, I don’t find it that useful but you might. When you jump on someone else’s User Settings the first difference you’ll notice is their Timeline View if they have one setup. Some like to drag the timecode track between the video and audio tracks. You’ll definitely notice if they color their tracks differently (I like pale yellow-orange for video tracks and a light blue for audio). However you want to stylize your timeline view it’s up to you – just make it efficient for your workflow. There are four basic timeline views that I use and firmly believe every editor should use as well. Those are: Default, Audio, Tiny and Big/Stringout. I wrote a post over on ScreenLight’s blog some time ago where I go into detail on each one and how to manipulate your timeline for each workflow. The gist of it is to change the track sizes, color and pick the data shown then save it at the bottom of the timeline. Seriously though, if you’re interested in doing this (and you should be), read the aforementioned post. Quick Transitions are great if you use any transition frequently, which I assume you do. This is the dialogue box that pops up with you hit the \ key to set your dissolves. Media Composer comes with Dissolve, Film Dissolve, Film Fade, Fade to Color and a few others as defaults. But do you know you can add your own? Create a bin labeled exactly Quick Transitions. Then drop in your own transitions (wipes, flashes, etc.). This Friday I’ll be announcing the first ever product for Edit Video Faster. It’s a bin full of over 50 preset Quick Transitions. You can get it along with more information here. On Friday I’ll be coming out with an in-depth tutorial on my YouTube channel on how to setup your own custom Quick Transitions Bin. You can find that tutorial here. Get a head start on creating your bin with 50+ preset Quick Transitions here! Each and every time you export a file from Media Composer you should save an Export Setting if it’s something different than you already have. Why? You can export a QuickTime movie at least a thousand different ways but you might not remember every detail (frame rate, key frames, compression type, etc.) of the handful of types of .movs you use. Why try to remember every detail if you can save the settings with a detailed name each time? When you export, click on Options under Export Settings. Adjust the parameters for your export then click Save As… Give it a unique name – ex: QT 1920×1080 30fps or QT-HQ-WebDeliveryForCompression. Next time you go to export you can find that setting in the drop down menu and won’t have to change any parameters. You can do this for any file that Media Composer exports (.pngs, .wavs, etc.). Presets save you loads of time and only take a few minutes to setup. Workspaces, Timeline Views, Quick Transitions and Export Settings all do this. What are your favorite presets to create in Avid Media Composer or your NLE of choice? Lastly – if you want to get a jumpstart on your Quick Transitions bin, head on over to this page. It’s simple, affordable and only takes a few minutes until you have 50+ preset Quick Transitions. See you on Friday with a new tutorial! Hey there! It’s Friday so that means a new tutorial. This tutorial is on how to create a blurry text transition in Adobe After Effects. I have some really excited news for next week. I alluded to it in my post on Wednesday. Hope you’re ready! Make sure you subscribe to get email updates so you don’t miss it. Did you find this tutorial helpful? If so, pass it along to a fellow editor who could benefit from it. Quick Update: Phew. I’ve been on the road the past few days and I’m so glad to be back at home and back on my normal schedule consisting of 5:00am alarm clocks instead of 3:30am alarm clocks. Last week I started building my first product for EVF and finished it up this week. There’s just some testing to do and some other things to get setup on the backend. More on all this next week. Until then let’s talk about something that can often be overlooked but has the potential to return huge results. This morning I was racking my brain on some ways I could deliver exceptional, unexpected customer service for this awesome client I’m finishing up with. I thought I could share them with you and get your thoughts as well. Some I’ve done, some I’ve been on the receiving end of and some I just thought of. Providing exceptional customer service, especially when it is unexpected, is a sure-fire way for a client to remember you. Most of the time we’re worried about hitting our deadlines. This is vitally important as well but don’t forget about treating the client better than they expect. Not only will they be pleased but also they’ll be more apt to work with you in the future and recommend you to their friends. Now let’s get to the list. #4 is my favorite! 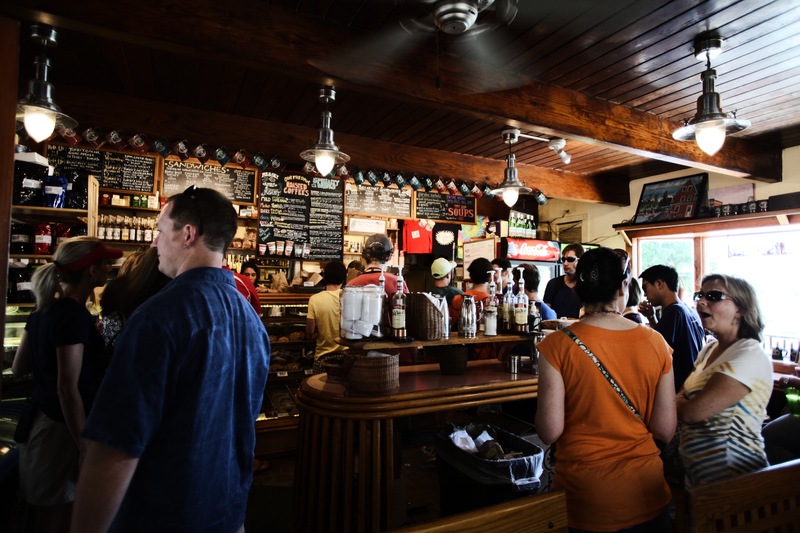 What’s your favorite way to provide exceptional, unexpected customer service? Monday night was the season premiere of Castle. It’s right up there with The Walking Dead for me. They are interchangeable as my #1 and #2 favorite shows. Last night I couldn’t wait for the Season 7 premiere as Season 6 ended in a cliffhanger. After the show I was left questioning how one poorly constructed montage had completely destroyed the credibility of many of the relationships the main character had built with other central characters. Note #1: This will contain many spoilers. Note #2: You don’t need to be a fan of the show to read this post. What I’m going to get into will go beyond the reach of the show and I’m merely using it as an example.